The Mausoleum was built in 1742 on the instructions of Henry Thompson whose family had purchased the nearby Kirby Hall Estate 55 years earlier. 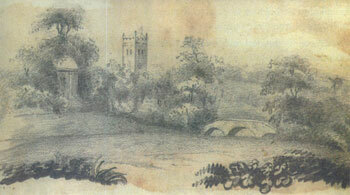 The first interment was of Henry’s daughter Margareta in 1743 and there followed a further 23 members of the family being interred during the next 167 years. The last of these was Elizabeth Ann, Lady Meysey-Thompson, the wife of Sir Harry Steven Meysey-Thompson, who died at the age of 92 in March 1910. The family moved away from the area in 1919 and the building became neglected until The Friends of Little Ouseburn Mausoleum took matters into their own hands and decided that something had to be done if the building was to be preserved. The problems for the building were exacerbated in 1945 when a Halifax bomber crashed with its bomb load and exploded less than 100 yards from the Mausoleum causing considerable damage to the building. 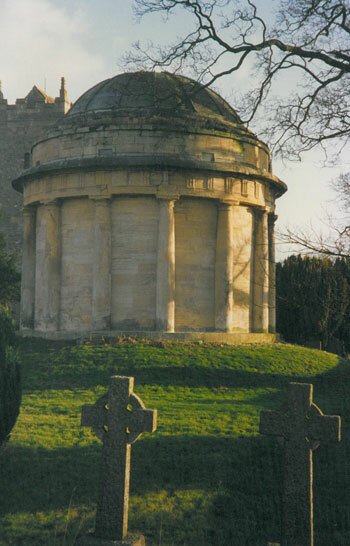 This, together with the fact that most of the lead had been stolen from the roof exposing the wooden dome to the elements resulting in eroding stonework due to damp and iron cramps rusting away, meant that considerable work and costs were required in order to renovate the Mausoleum. With the help of Peter Pace, the church architect, The Friends raised the necessary funds to complete a total restoration of the building for future generations. 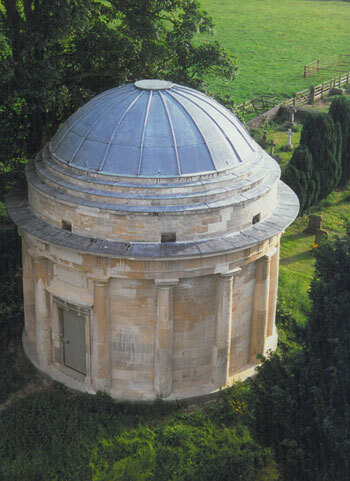 The Mausoleum is built in sandstone ashlar with a lead covering over a timber roof. 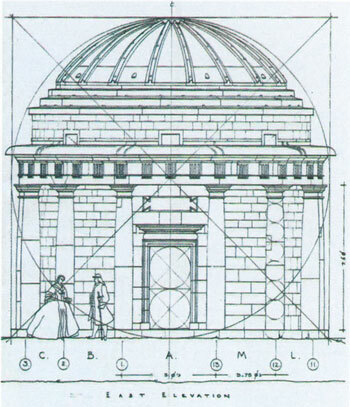 It is a Rotunda and circled by attached Greek Doric colonnades with triglyph frieze and cornice supporting the plane drum and ribbed domed roof. There are thirteen non-uniform columns with eight internal bays which is now recognised as Baseless Roman Doric style rather than Greek Doric or Tuscan as was the original view. The floor was repaired and a stairway to the crypt constructed in addition to a gate to the entrance being manufactured based upon the original 18th century design using traditional methods of construction. A small piece of the original gate had been preserved and this was incorporated into the new gate. There is a raised ledger stone at the head of the slab with a splayed stone surround on which is inscribed: “THE THOMPSON MAUSOLEUM RESTORED 1993 – 2004 BY THE FRIENDS OF LITTLE OUSEBURN MAUSOLEUM WITH CONSIDERABLE LOCAL CHARITABLE SUPPORT, ENGLISH HERITAGE, AND THE HERITAGE LOTTERY FUND”. This was designed and carved by Charles Smith FRSA who had previously re-cut the inscription over the Mausoleum entrance. The Mausoleum was gifted to this Trust in 2009 in order to guarantee its future preservation.